and fire damage restoration services for residential and commercial properties, offers the following safety tips to protect loved ones and property. According to Keith Trembley, have a disaster plan and emergency kit in place, establish a location in the house to meet, and know the nearest designated storm shelter if you have to evacuate. Water – one gallon of water per person and pets per day for at least three days. Food – at least a three-day supply of non-perishable food for adults, children and pets, along with a can opener. Battery-powered or hand crank commercial radio and a NOAA Weather Radio. First aid kit – sterile dressings; antibiotic ointment; scissors; thermometer; non-prescription drugs such as pain relievers; prescription medications and supplies. Copies of insurance policies, identification and bank account records in waterproof container. Below are some valuable tips for protecting your property from severe weather. Clear yard of loose articles and debris. Keep yard tools, patio furniture, grills, garbage cans and toys stored when not in use. Trim trees and shrubs to prevent branches from breaking off during high winds. Inspect your roof and repair any loose shingles to prevent leakage from water and winds, and remove debris. Repair siding, awnings, gutters, downspouts and brackets if loose or damaged. Secure major appliances to the wall studs or foundation of your home using “L” brackets. Contact a licensed professional or restoration and emergency services company if damage to your home or business is significant. Qualified technicians are certified from The Institute of Inspection, Cleaning and Restoration Certification (IICRC). For more information, visit the local Paul Davis office website at www.keithtrembley.com. Paul Davis Restoration, Inc., a subsidiary of FirstService Corporation (NASDAQ: FSRV; TSX: FSV), is a national franchisor and leading provider of restoration services for residential and commercial properties since 1966. Paul Davis Restoration also provides advanced mold cleanup services and has franchise locations throughout North America with owners and technicians who are certified by The Clean Trust. For more information, visit the website at www.pdrestoration.com. This is a Maine vacation home Keith Trembley Builder, Inc. built in 2011 for a long time client. The home sits on the shores of Brassua Lake just a couple miles from Moosehead Lake. Moosehead Lake, our states largest lake, is known for its salmon and trout fishing. Brassua Lake also has very good brook trout fishing and is part of the Moose River chain. Keith fished the lake and river for 20 years when he was younger and has many fond memories of those trips. There are very few camps on the lake and you rarely see another fisherman. This home is a log home with breathtaking views of Maine. The interior is open to the ceiling with exposed wood beams and tongue and groove pine ceilings. The windows are high performance Anderson Windows with a lot of glass facing the water. The floors are all pine, finished right on site. A nice slate hearth is the show piece of the great room. The slate comes from the Monson Slate Company, also a local Maine company. A wood stove adorns the slate hearth and adds the finishing touch. The simplicity of this home makes it a perfect maintenance free escape for a getaway. Keith Trembley Builder, Inc. has been building waterfront homes for more than 32 years. We provide everything from consulting on the new building site, to layout, and permitting through the completion of your project. Our five year warranty on workmanship is unmatched. The views from the front windows and loft area are the wow factor provided by Brassua Lake. The natural beauty and quiet of the area are not to be left out of what makes this Maine vacation home so beautiful and inviting. March comes in like a lion, but it doesn’t really go out like a lamb. Instead, the spring storms that arrive during this time of year depart like St. Patrick’s Day revelers who’ve had too much green beer—it can get a little messy. Since your house is just waking up from a long winter nap, right now it needs extra TLC. Below you’ll find some of the fastest, easiest ways you can get your property ready for the spring storm season. Some of these fixes are DIY projects while others may require professional assistance. Rest assured that Paul Davis Restoration/Emergency Services of Maine is here to help give your home a springtime makeover in preparation for the boisterous weather ahead. With thunderstorms, it’s not really the thunder that gets you—it’s the rain. The Northeast may not have as many thunderstorms as the Midwest, but we aren’t exempt from copious downpours in the spring. Warm, moisture-laden air travels over most of the country at this time of year, bringing much needed water to freshly sprouting vegetation. You’ll enjoy those May flowers. 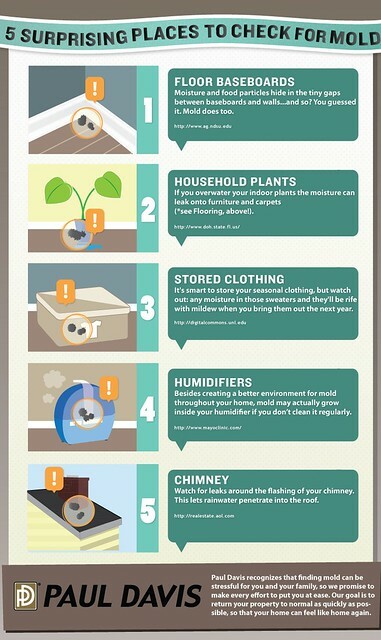 In the meantime, you may not enjoy the flooding and mold problems that happen when rain is too much of a good thing. •	Clean out your gutters and check them for leaks. Don’t forget to check the downspouts for hidden clogs. Use a garden hose sprayer and a plumber’s snake to unblock downspouts if necessary. •	Consider grading your lawn and installing French drains to direct water away from your foundation and prevent water from pooling in your yard. •	If you have a basement, ensure that the sump pump has a backup power source. Otherwise, it won’t do you any good during a thunderstorm accompanied by a power outage. Installing a backup sump pump is also a good idea. You might even install one with an alarm that lets you know when the basement is flooding. These days, alarm messages can be sent to your phone! That final snowstorm can arrive even when all signs point to spring. In fact, the “Storm of the Century” in 1993 hit the entire eastern seaboard with unprecedented snowfall in the month of March. The East Coast can expect a final snow in March or even April before Jack Frost hangs up his hat for the year. •	Close the screen door on your front door and your sliding glass door. This provides you with a bit of a buffer if snow piles up against the doors. You can open the inner door to check things out without a heap of snow falling inside. •	Pre-treat sidewalks and walkways with de-icing products and sand. This can help break up potential accumulation in areas you may need to access to check for water and ice damage after the snowstorm. It’s also a great way to use up any leftover de-icer in your garage! •	Have any leftover snow from previous storms removed from your roof in preparation for a spring blizzard. Snow removal reduces the total load of snow on your roof and lessens the chance of collapse. This is especially necessary for spring snow because it tends to be particularly heavy and wet. With Hailstones Like These, Who Needs Golf Balls? Hail is something every Northeastern homeowner dreads, but it’s also a concern for the eastern seaboard as well. These storms are often accompanied by lightning and high winds. It’s like Nature is pitching a fit—when it all starts hitting the roof it’s not a pretty sight. •	Close your blinds, shades or curtains. Fasten these window coverings to the windowsill or wall with tape or tacks. That way, if hail does break a window, the glass won’t be blown throughout the room. •	Stock up on some plywood and plastic sheeting so you can immediately patch up damaged windows and prevent rain from getting inside your house. •	Use thick blankets to protect vehicles and other property that can’t be put under a carport or in the garage. This may reduce the impact of hail enough to avoid paint damage and minor dents. •	If the hail is severe and large (at least ¾” in diameter), go ahead and call a roofing restoration specialist while you wait it out. That way, you can be one of the first clients on the list for damage assessment and repairs after the storm. High spring winds are common in the Northeast as the weather warms up. Knowing that you’ve done what you can to keep your house from being totally trashed can help you ride out these wind disasters. •	Consider protecting your home with roof tie-down clips. These clips anchor the roof deck to the frame of your house to make the whole structure stronger. Unlike many other roof upgrades, they don’t require extensive retrofitting. •	Install storm shutters and wind resistant doors. These can be helpful in protecting against wind, keeping out water and preventing damage from tornadoes that are accompanied by hail. •	Add a vertical bracing system to your garage door. This type of system takes only a few minutes to put in place (after initial installation) so you can prep your garage at a moment’s notice. •	Prune trees so that the branches are a safe distance away from the roof or other structures around the house. Branches scraping across the roof can do a lot of damage to shingles and flashing. Broken limbs falling on your roof can cause an instant leak. •	If a piece of yard furniture is light enough for you to lift it, high winds can probably pick it up too. Store loose furniture, toys, decorations, lawn equipment, and other items in a garage or shed. Offer to help neighbors move their lawn furniture too since windstorms don’t respect property lines! Have you ever seen video images of a mudslide in action? The power of all that wet soil bearing down on houses and other buildings is immense. Mudslides in the Northeast affect homes in several significant ways: structural damage to the foundation and load bearing walls from the weight of the mud, water damage from related flooding and infiltration with bacteria and sludge from broken sewer lines in the affected area. At Paul Davis Restoration/Emergency Services of Maine, we have experience restoring all of the types of damage your home may sustain in a mudslide. We want you to know that you can pull through disasters like this with help from our experienced and compassionate restoration professionals. The primary danger areas for mudslides and flooding in the U.S. are along the West Coast. However, that doesn’t mean Maine residents are out of the clear. This danger can occur anywhere there is steep terrain or unstable soil, which is common throughout the East Coast. Most landslide or mudslide events are precipitated by heavy rainfall events. They can also be associated with other natural disasters such as snowmelt from unusually heavy winters. A broken dam or levee can also inundate small cities and towns with muddy water. 1. The Johnstown, Pennsylvania Flood of 1889 was the result of a dam giving way. It burst at its sides and lurched forward under extreme heavy rainfall. In addition to 17 million dollars* of damage, it killed an estimated 2,200 people. Man-made dams are common throughout the U.S. If you live near one, be sure that your city is diligent about regularly inspecting and maintaining it for safety. 2. In Haverstraw, New York, on January 9th 1906, 22 people were killed when a large landslide buried eight houses. Haverstraw, then the brick-making capital of the world, was experiencing a crisis as the blue clay beneath the village was being mined faster than the city could sustain. Cracks that began forming along Rockland Street were ignored by enterprising brick-makers. Finally, on January 9th, a series of three landslides hit the city, killing people and swallowing roughly a third of the village and setting buildings ablaze by knocked over kerosene lamps. Thankfully, the East Coast isn’t prone to these types of large-scale loose soil dramatics. Haverstraw is a good reminder to homeowners however, that ignoring cracks and other signs of wear and tear around your home is a disaster waiting to happen. 3. When it rains it pours…sometimes for 40 continuous days! In the fall of 2011, Hurricane Irene and Tropical Storm Lee left eastern Virginia, southern New York and western New England showered with more than 300% of normal rainfall. Eastern Pennsylvania, northern New Jersey and southeastern New York were also swimming in more than 500% of normal! This super soaker not only caused record breaking floods throughout the region, the Mountain Lake community in Liberty Township, New Jersey, experienced a mudslide that swallowed cars and homes 30 feet into the ground. While this event was, indeed, “out of the norm,” weatherproofing your property in advance can give you peace of mind and make all the difference in an unexpected or prolonged weather-related event. 4. The spring of 2007 came in with a roar when a devastating storm pounded the Northeast causing property damage of every variety throughout the region including snowstorms, windstorms, rainstorms and flooding. From New York, to North Carolina to Maine, the storm left nearly 700,000 homes and businesses without power, massive flooding left refrigerators and cars floating down rivers, mudslides and fallen trees blocked roads from Kentucky to New England. A well maintained home is one that’s prepared for several different kinds of weather events—you never know when one will hit, only to trigger another! 5. An unnamed 1938 Hurricane hit the Eastern seaboard of the U.S. and killed 494 people in associated floods. It caused 306 million dollars in damages. The scope of these disasters makes them difficult for any community (or even the federal government) to manage. This is one good reason to have our number. That way, when a mudslide or wet weather disaster strikes, you can call someone who cares and start restoring your home as soon as possible. Paul Davis Restoration of Maine assists communities with mudslides and other weather disasters. *All dollars are unadjusted unless otherwise noted.